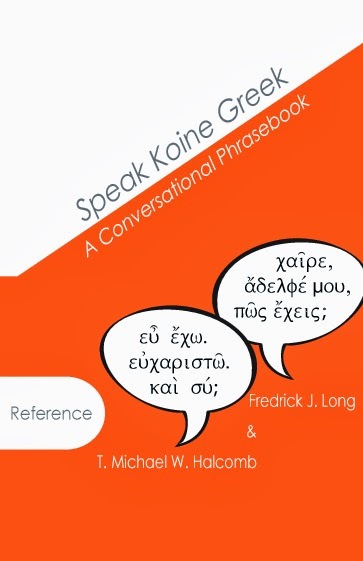 The Blog of Dr. T. Michael W. Halcomb: New Book: "Speak Koine Greek: A Conversational Phrasebook"
New Book: "Speak Koine Greek: A Conversational Phrasebook"
Hello friends, I am pleased today to announce the release of my newest book, co-authored with Dr. Fred Long, titled Speak Koine Greek: A Conversational Phrasebook. Speak Koine Greek contains over 240 sayings, expressions, phrases, idioms, and figures of speech from ancient (Koine) Greek. This work has been strategically arranged into simple categories (Getting in the Conversation, Staying in the Conversation, Ending the Conversation) with each entry ordered alphabetically by English glosses and followed by both a phrase that is similar or comparable in Koine as well as a source citation. Speak Koine Greek is a user-friendly compilation of expressions meant to help learners progress in fluency and knowledge of Koine while having fun doing so. You can purchase the book on Amazon.com HERE or HERE. As a further add-on, companion audio files for this book are available for purchase and download at the GlossaHouse website HERE. "Michael Halcomb and Fred Long treat us to a smorgasbord of Koine Greek expressions for conversation. By learning how to speak in the language of the New Testament, which is what this book helps us do, one's reading ability of the Greek Bible can grow exponentially. I commend this book to students, teachers, or anyone interested in learning to converse in Koine Greek."